Web users have options -- thousands of them. It's one of the reasons the Web is so useful but also one of the great challenges of Web business. How do you make sure your site is the one that stands out amid the rest and that users keep coming back for more? The answer is to provide the most relevant experience to users' expectations. Largely, this can be accomplished with a well thought-out design. We can often get sidetracked by ideas that might seem innovative but, in the end, don't deliver on the promises our brand makes to consumers. For instance, if you're running a business blog it doesn't make much sense to have a lengthy Flash intro -- your readers are likely busy professionals that want access to information as quickly as possible. Below are three examples of websites that are designed to cater to their core audiences. They know their users' preferences and deliver exactly what they want without delay and in a way that reinforces the brand as the best in the business. Columbia's focus is durable, high-quality outdoor gear. As soon as you land on the page, the outdoor mood is set -- a lake and trees frame the page and each product photo features an outdoor scene. What's most impressive about this website can be seen at the top-right and bottom-left of the page, "shop by activity." 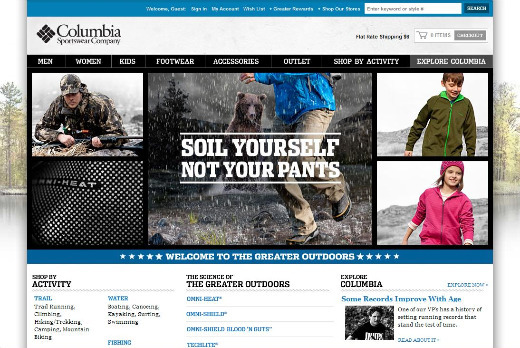 Columbia knows that its customers are looking for specialized gear that will be appropriate for an outdoor activity -- fishing, hunting, trail, water, etc. So, users can click on the activity then be presented with appropriate jackets, pants, shoes, hats and more, for each activity. Not only is this convenient for the shopper (as most of these activities require more than one piece of special gear), but gives Columbia an opportunity to cross-sell in a most sensible way. National Geographic is known best for amazing photography and exploring the farthest corners of the world. Landing on the website, the user is immediately sucked in by a stunning photograph. Or, transfixed. And that gives the site just long enough to scroll through five featured stories ranging from nature to culture and science. 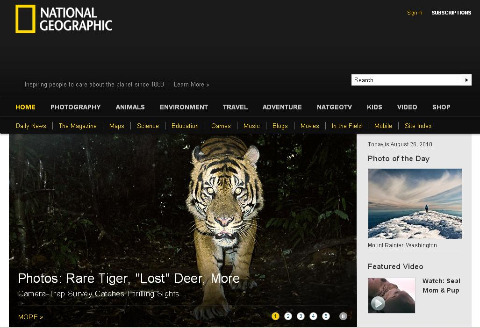 There's a photograph of the day, featured video and highlighted links to encourage exploration of National Geographic's award-winning content. Further down the page is the Nat Geo TV schedule, options to get involved with the community and links to subscribe to their publications. The site does an outstanding job of presenting exclusive content -- exactly what visitors want. Apart from links to Facebook, Twitter and other social sites, there is no encroachment of content from other sources. It's not pretty, but Baseball-Reference.com delivers exactly what its users want -- quick and easy access to information, and lots of it. This site is a stripped-down treasure trove of baseball statistics. 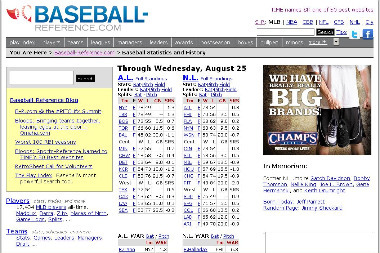 When landing on the page, users are immediately presented with some of baseball's most important statistics, the standings, and a highlighted section that invites searches of its ginormous database. Further down the page is the ability to sort through data about specific teams, managers, minor leagues and even past drafts -- by year, college, position, team and more. The page is actionable and presented in a way that encourages classic research (right down to the standard underlined links) and avoids distraction, much like Google and craigslist.